The Fuel Everywhere card keeps you movin’. From daily commutes to epic road trips, fuel up along the way everywhere Visa debit is accepted. 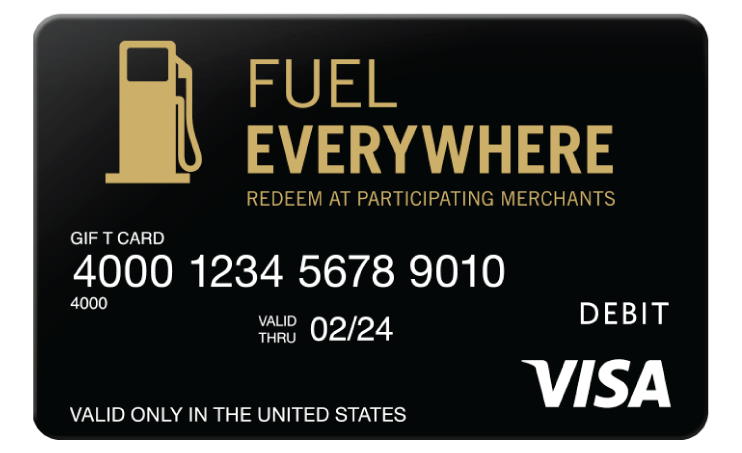 Use your Fuel Everywhere Visa® Gift card for fuel, snacks, and services at national or local service stations everywhere Visa debit is accepted. Other services such as oil changes, smog checks and more! How do I use my Visa Gift Fuel Everywhere Gift Card? Your Card can be used to purchase fuel, snacks and services at any national or local gas station in the US where Visa debit cards are accepted. The amount of every purchase you make will automatically be deducted from the value on the Card. Your Card is not redeemable for cash, except as required by law. It cannot be used at ATMs, for gambling, or at merchants requiring a manual card imprint. Additional restrictions may apply. Can I pay at the pump with my Fuel Everywhere card? Registration helps protect your money. If your Card is lost or stolen, you can request a new card by calling 1 (877) 341-5484. If you do not choose to register your Card, we suggest that you write down the card number and customer service number from the back of the card on a separate piece of paper in case the card is lost or stolen. Call 1 (877) 341-5484 to make automated balance inquiries 24/7. No, there are no fees after purchase. Yes, your Card will no longer work when the remaining value is equal to $0 or the “valid thru” date printed on the front of your Card has passed. If funds still remain on your Card after that date, please call 1 (877) 341-5484 to have a replacement issued and mailed to you at no cost. The balance on the replacement card will be equal to the balance on your discontinued card. Yes, your initial Personal Identification Number (PIN) will be the last 4 digits of your Card number. However, we suggest you change your PIN through the cardholder website or by calling the number on the back of the card (for more information, see the “Personal Identification Number” section in the Cardholder Agreement below). Note the PIN can only be used for purchases and cannot be used to obtain cash at ATM’s or cash back with a purchase. If your Card is lost or stolen, call Customer Service IMMEDIATELY 24/7 at 1 (877) 341-5484 to cancel your Card. You will need to know your Card number, so if you choose not to register your Card, be sure to record the number in a safe place. You may also be required to provide additional information. If funds remain on your Card, you will be sent a replacement card at no cost. If you wish to dispute a transaction on your card account, you should always first try to resolve your dispute with the merchant. If that doesn't work, please go to www.Fueleverywhere.com/dispute for more information. Call us 24/7 at 1 (877) 341-5484. Distributed and Serviced by Blackhawk Network California, Inc. © 2015 Blackhawk Network and MetaBank. All rights reserved.